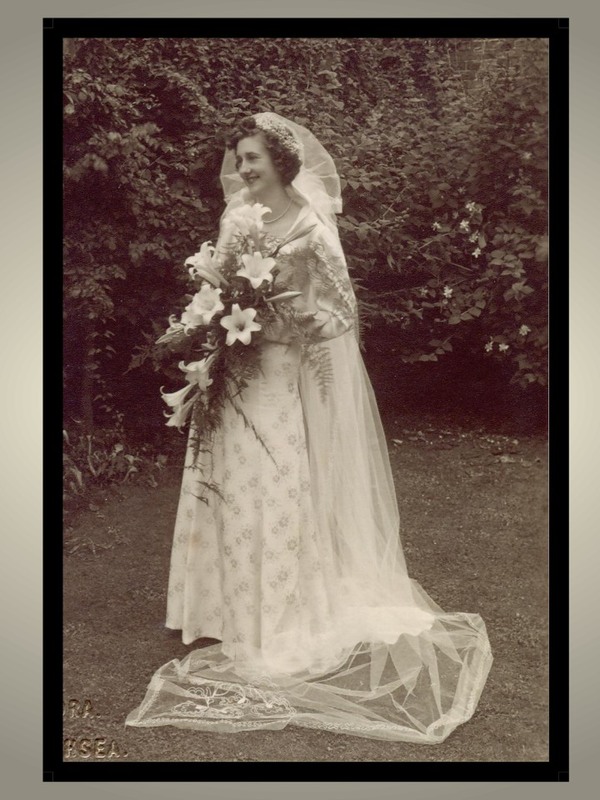 May was born Mabel Florence Deeprose, on 7 May 1918, at The Laurels, Ninfield, East Sussex, a few miles north-west of Hastings, near the historic town of Battle. Her parents were Rufus Deeprose (1870s?-1957) and Alice nee Cramp (1877-1959), who were devout Wesleyan Methodists, and very involved with village life. Rufus was a third-generation market gardener, although he also bought and renovated houses, which he later sold for a profit.. The Deeprose family also owned the Greengrocers business in Sackville Road, Bexhill for three generations. Alice’s father was an agricultural labourer. Rufus and Alice were marrried in 1901 and had a son Albert Edmund in 1902. At this time they lived in The Bogs, at Hooe, a little village south of Ninfield. Albert was what used to be called a 'blue baby' (a congenital heart disease / 'hole in the heart'). He died in 1916, aged 14. Alice had many pregnancies after Albert, but these were either aborted or stillborn. By the time May came along, Alice was 43. She stayed in bed for the whole of her pregnancy, and was hence dubbed 'Lady Deeprose' by her friends. 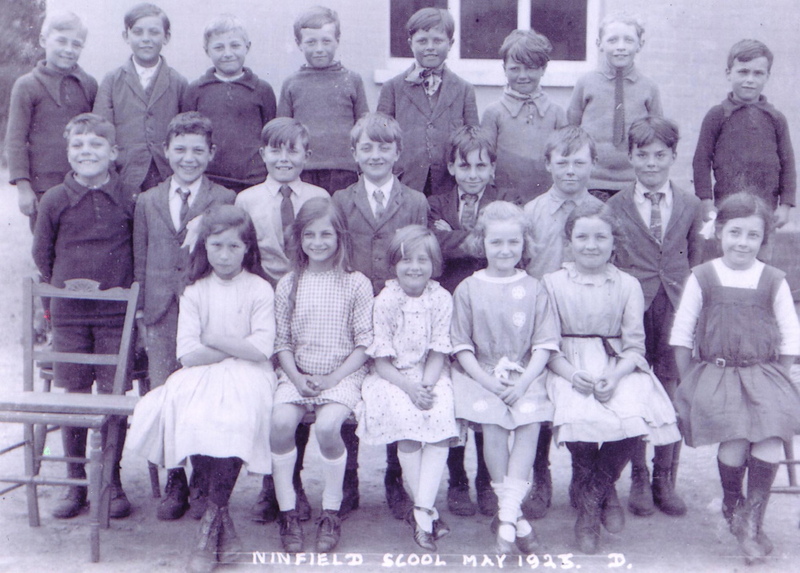 May went to Ninfield school from age 5 to 10 (photos above). She recalled that she didn’t want to go to school, and used to throw tantrums, so for a time her father had to double her on his bicycle to make sure she actually arrived. After that, she went to the Girls School at Sidley, a village a few miles away which is now part of Bexhill. She recalled being given the rod for misbehaving, probably because she used a few ‘bad’ words. On the other hand, music was prominent in May's life from an early age. Rufus played the cello and Alice the violin, and so it followed naturally that May would also learn an instrument, in her case the piano, although she became proficient on most stringed instruments. Rufus was Superintendant of the Sunday School as his father and grandfather before him, so even as a child, May played the organ at the Wesleyan Chapel for Sunday School, Church services and other church and village events. About 1928, when May would have been 10, her father supplied bail for one of his brothers who had run foul of the law in some way – probably fraud or similar, but May was never told any details. His brother absconded and the bail was forfeit. This caused May's father much distress, because of his devoutness and the shame to the family, and he had a nervous breakdown. The family moved briefly to Bedford, north of London, about 1930. May said they lived with an uncle, but she was not sure who. (The only one Anne knows who moved to the north is Frank Deeprose, whose grandson is now near Oxford. She doesn't believe any of Alice's brothers left the area). May contracted shingles, and from there the more serious illness of rheumatic fever. Her parents were advised to take her to Bath to 'take the waters', which they did. May said her attendance at school was very sporadic, but remembers going to a small school outside Bath. During their time there, May continued to excel at her musical studies as well as taking exams in bible studies, as chronicled in the Bath newspaper of the time. Their financial circumstances were such that when they were offered a position of caretaker and housekeeper for an elderly widow in about 1931, they accepted and moved to 13 Cavendish Road, Portsmouth. This was a 3-storey terraced house, and May had the top floor, her parents the middle, and the widow the basement. May met Fred in the summer of 1932, both then aged 14. She was on the way to fetch the family's dinner from the fish and chips shop. The chit-chat was long, and the dinner was late. After that first meeting, she used to look out her window each morning and wave as he rode by on his bicycle on the way to work. Apparently her parents were not happy about the liaison until they were told he was the grandson of Mr Haskins, the manager of Whitcombe's grocery in Palmerston Rd. He then became most acceptable to her parents. May continued both her schooling and her musical studies and won many prizes for her examination achievements and eisteddfod performances. She said there was a boy who always beat her in the piano performances, but she could always win the sight-reading. Her first job was as a babysitter (photo above). May became a student teacher at Grindelwald Girls School, where it is thought she remained until her marriage in 1939. On March 15th 1939, German troops under Hitler invaded Poland. After Hitler refused to withdraw his invasion forces, Great Britain and France declared war on Germany on 3rd September. Fred was refused permission to enlist because he worked in the Dockyards, in a prescribed category of employment. Fred and May were engaged in 1937. 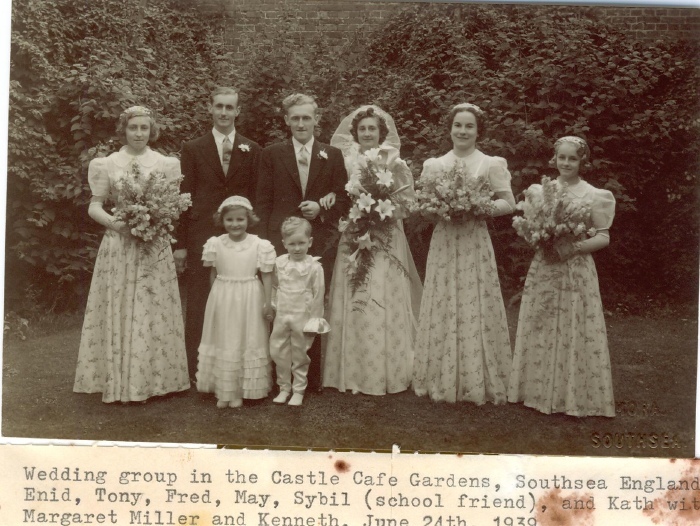 They married on 24 June 1939 at St Judes Anglican Cathedral, Portsmouth (photos above), and spent their honeymoon at Hastings. The wedding party were all members of the Clarke and Haskins families. When they returned to Portsmouth, May said they had only 6 pence (today worth about $10) left until his next pay – a daunting way to begin a married life. They moved into Grayshott Rd (very close to Pompey's home ground, Fratton Park). 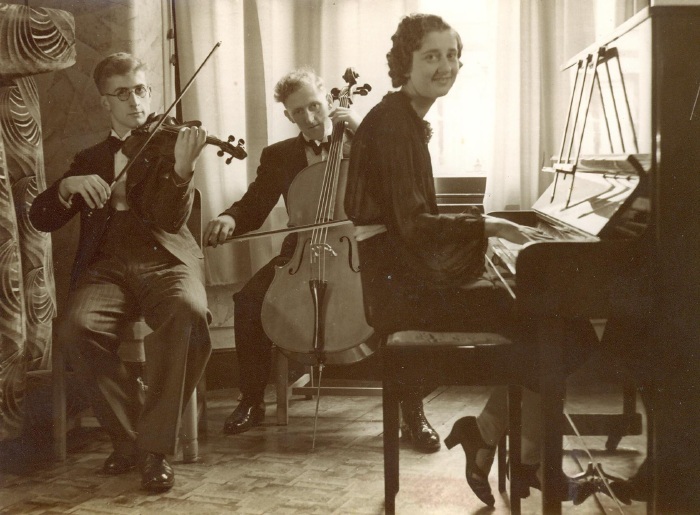 Pre-War, May (piano), Fred (cello), and Fred's younger brother Tony (who says he was a poor violinist) amused themselves at home as a trio, and occasionally a very good violinist (Sam Coates) came to make a more successful quartet. The photos above were taken at the beginning of the War, in December 1939, with Sam, Fred and May in the front room of Grayshott Rd. Fred can probably attribute his learning of the cello to May, who used to give him lessons. Fred's musicianship had been gained from an early age from choral work at St Judes, so this would have been a relatively easy transition. 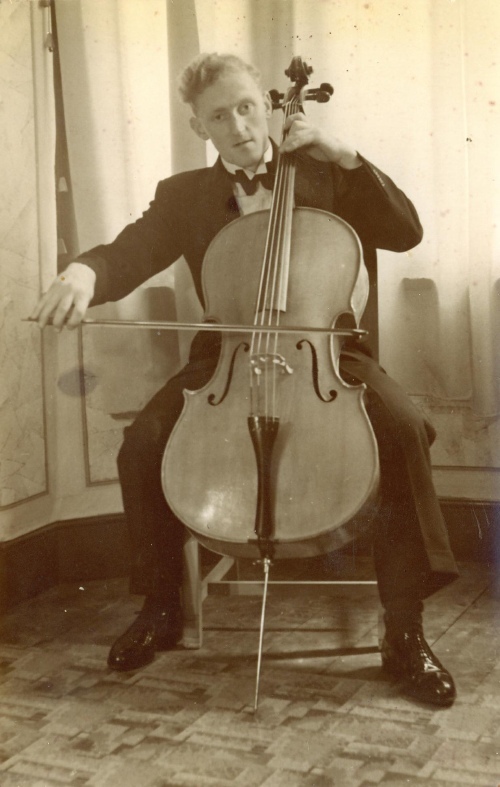 Fred became a fairly competent cellist, and his cello was later given to May's most talented student, who, post-2000, still played and cherished it. Fred's cousin, John Miller, always credited May with introducing him to opera, which was one of John's passions. Portsmouth was a naval base and was a target for German bombers during the Blitz. There was a munitions factory behind their house. During the first big raid on Portsmouth on 10 January 1941, when May was heavily pregnant with her first child, Michael, she and an elderly neighbour had to take refuge in the Anderson Shelter which Fred had built into the back yard. The bombs struck their row of houses, completely demolishing the neighbour’s house and badly damaging theirs. The rubble fell onto the shelter, trapping them inside. It took several hours to clear the debris and free her. She had the medics worried for a while. After they were rescued, May said they were told to go to a gathering area, but she didn’t. (No surprise there). May said she walked about a mile through the bombed out streets in complete darkness to her parent’s place. Michael was born a week after the raid, on 17 Feb 1941. May and Michael were evacuated 10 miles north to Soberton but May wouldn’t stay and went back to Portsmouth – again confirming the image of a strong independent free spirit! After the war was over in late 1945, Fred was still working at the Dockyards. As this was a contracted tenure, with the War over, jobs may have become less secure. Doctors also advised that Michael would benefit from a drier, warmer climate as he had a lung weakness. In 1947 they were offered the chance of migrating to Australia where there was a shortage of skilled tradesmen. 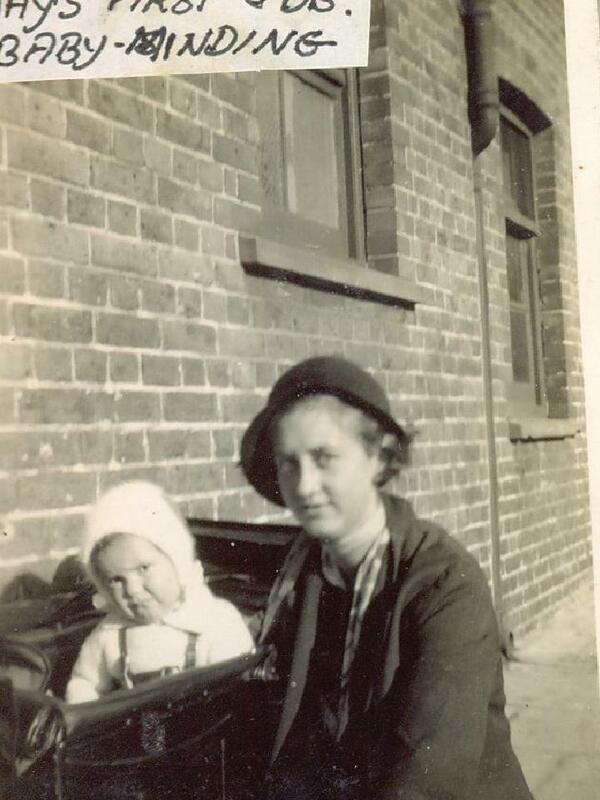 During the waiting time, the family lived at 98 Reginald Road, Bexhill with other family members. The family's migration was sponsored by May’s uncle, Ernest Cramp, her mother’s younger brother, who had a dairy farm at Tarong outside Kingaroy. Ernie had migrated to Australia in 1911, where he later married Ruth Gardiner. Ernie and Ruth became surrogate grandparents for Michael and Anne. And so, on 27 January 1948, the family became ten pound poms, boarding the Orient Line's S.S. Ormonde at Tilbury Docks on the Thames. After a 6 week journey they landed in Sydney, took the train to Brisbane where they were met by relatives, then on to Maleny and finally arriving on the dairy farm at Tarong. The family settled in Kingaroy in South Queensland, where they were to spend the next 36 years. Fred had a job as a joiner. Their first living quarters was a garage at 16 Carinya Street on Hospital Hill until Fred built their first house. It was quite an exciting time for the family. In mid-1948, May was asked to teach Prep 1 and 2 for a while as they were short of teachers, and she soon became well sought after for her musical ability. Both May and Fred judged several ballroom dancing competitions, as they had learnt in England. May became Brown Owl for the local Brownies group (photo above), which was held in the Presbyterian Hall. 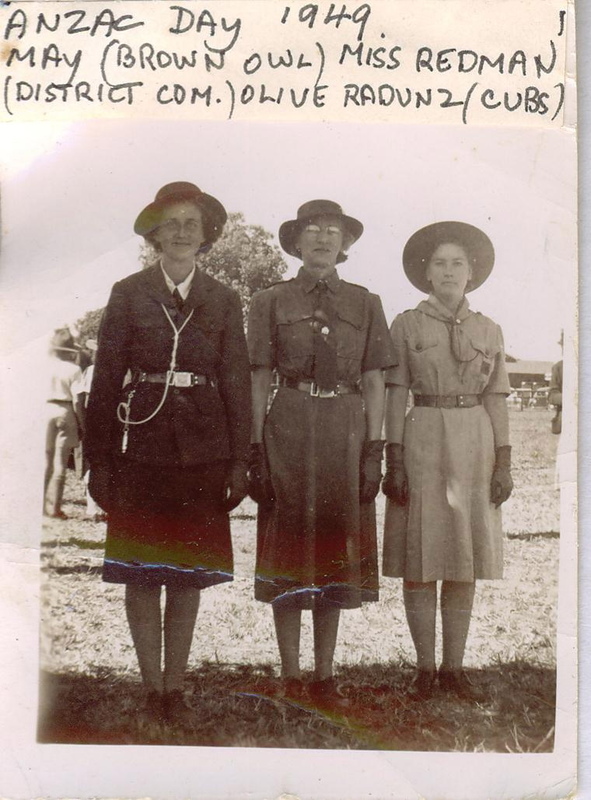 Also in 1949 May became a regular accompanist at the Kingaroy Eisteddfod, which at that time attracted many semi-professionals from Brisbane, Bundaberg, Maryborough and further. Many singers were amazed at May’s ability to sight-read anything they put up, including very difficult operatic arias, and how she was also able to also transpose the music into different keys at the same time. Paul was born in March 1953, and Peter in May 1954. In 1956, Fred, who had a flourishing business as a builder, decided to try his hand at poultry farming. In 1957, May’s father Rufus died and within months May’s mother Alice migrated to Australia, turning 80 on the voyage. May got her strength and determination from her mother. After a hard two years with high grain prices, poor egg markets and ill health, they walked off the poultry farm. With the help of May’s mother Alice, they bought 86 Walter Road, a small rundown cottage at Red Hill on 2 acres of land. Alice died in March 1959. 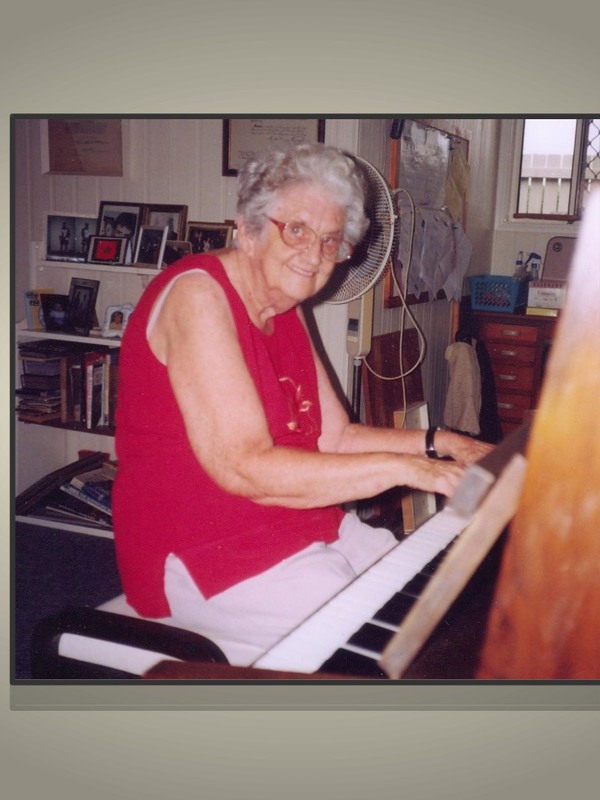 May continued the music practice that she had started while at the hatchery, establishing Kingaroy Music Studios, and before long was teaching well over a hundred students a week. May taught from Monday to Friday from 7 am till 9.30 at night, sometimes with only a couple of hours off through the day. On Saturday she taught from 7am till about 3pm. She also taught at Kumbia for a time, driving the Holden Ute out on her own, and staying overnight with a local family. May was very involved in the Kingaroy and District music scene, including musicals, concerts, dancing studios, ballroom dancing and school events. 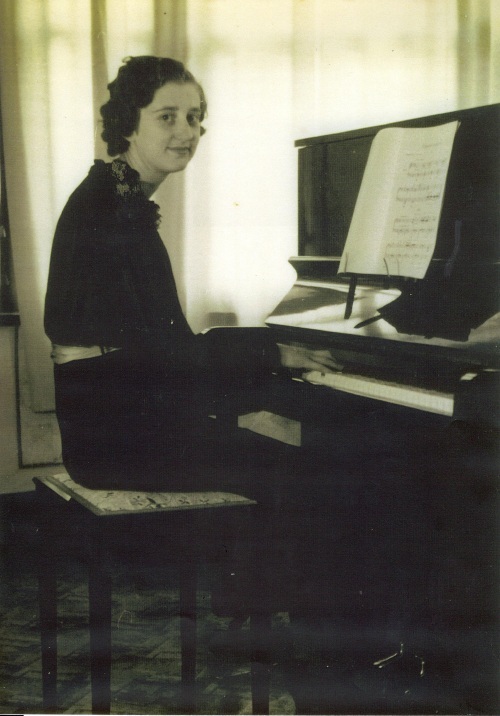 May produced concerts every year which showcased her students’ abilities and successes, and a number of her students developed musical careers. May was one of the many parents lobbying for Taabinga School to be relocated at Red Hill. She also worked with Taabinga School, producing many concerts in conjunction with the teaching staff and also wrote the Taabinga School Song, which is still sung today. She also composed with local lyrics writer, Nev Hauritz. Wednesday afternoons and Sundays were reserved for lawn bowls (photo above). 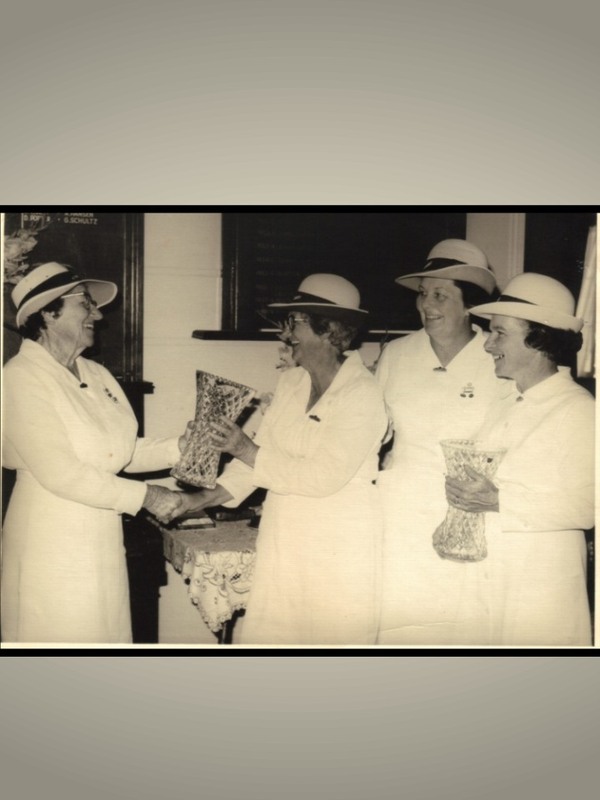 May was a very strong lawn bowler and won events locally and at district level in singles, pairs, triples and fours, usually as skip, and with many different partners, including the later State champion, Menice Murray. Night-time (after 9.00 pm) would see May sitting in the lounge watching TV and knitting her incredible creations. May continued teaching long hours, preparing students for exams, concerts and eisteddfods, as well as continuing as accompanist for the Choral Society and Eisteddfod, playing championship bowls, and maintaining a household. In 1982 May was chosen Quota Woman of the Year, and later that year she was awarded the MBE for services to music on 12 June 1982. Her MBE was presented to her by Queen Elizabeth ll at Parliament House during the Commonwealth Games. This was a real thrill for May as she got to shake Queen Elizabeth’s hand (gloves on of course) and speak for a brief time. She said she told the Queen that she had last seen her getting off the ‘Queen Mary’ when she (the Queen) was a little girl. When May lost the sight in her left eye in 1984, she decided it was time to retire. They sold their home and moved to Walker Street in Maryborough, where Paul and his wife Shirley were living. 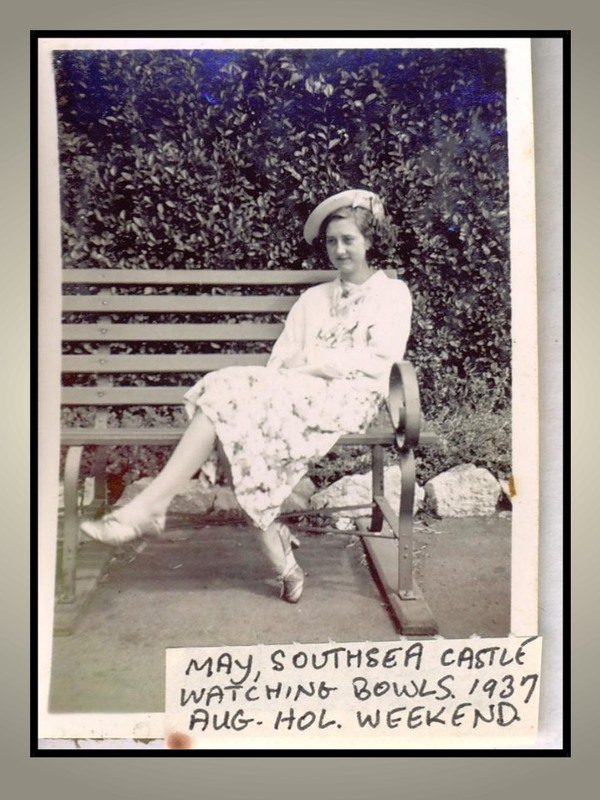 May continued to play, compete and win events in lawn bowls until her mid-seventies, c. 1993, when bad knees caused her to stop. In the early 1990s, Fred and May moved to Bundaberg where Michael and his wife Anne had transferred after a long stay in Tara. Michael was a senior technician with Telstra. In 1995, Michael died suddenly at age 54. Not long after that, Fred and May moved back to Maryborough. This time they bought a unit at Chelsea Retirement Village. 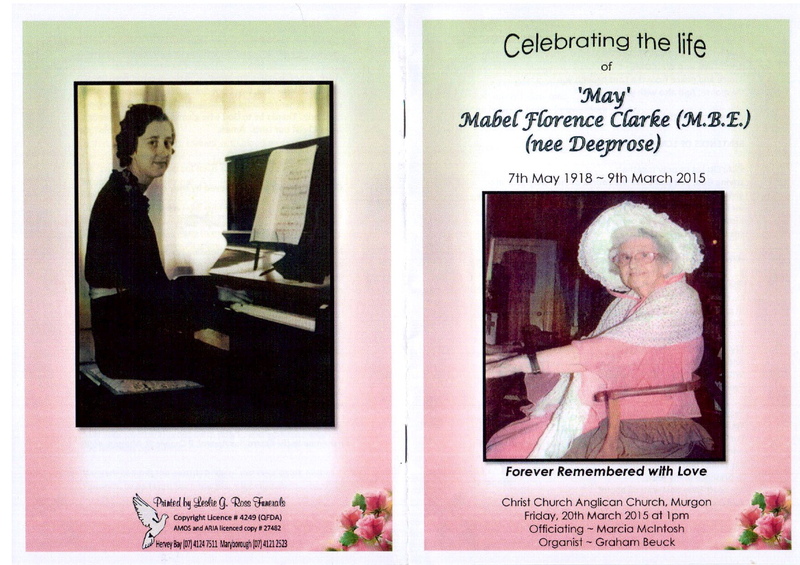 Here May played for church services, U3A choir and other groups who entertained at Care facilities. They continued to travel with the seniors’ tours until early 2000. May was also exceptionally clever at completing difficult crossword puzzles, plain, cryptic or clueless, and could make up crosswords with the clues but blank grids as well as constructing her own crosswords, creating clues, answers and the grid (photo above). Notwithstanding her literacy skills, she even adapted to Sudoku puzzles. 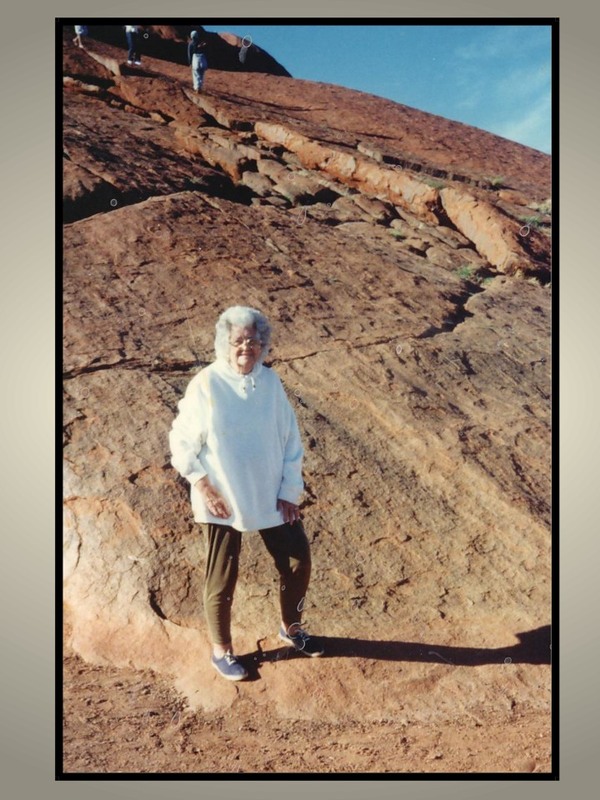 May subscribed to Lovett’s Crosswords, winning many prizes, including a trip to Uluru, where she took a helicopter ride over the rock and ‘the devils marbles’. She wanted to climb Uluru but wasn’t allowed (photo above). May had her 80th birthday on that trip in 1998, and rode a camel. May was also a very talented knitter. Both she and her mother used to knit cardigans and pullovers for the shops in England. They used to get 6 pence per garment. May designed and produced many magnificent garments, often while watching TV. She knitted rugs for her grandchildren and her great-grandchildren as welcome gifts when they were born. Each one is unique and took hundreds of hours to make, and are heirlooms to be handed down to their own families in the future. In her mid 80’s, c. 2002, May was ‘discovered’ by John Meyers who had just opened the Maryborough Military and Colonial Museum, and was looking for volunteers to help entertain the visitors. So May played for Ghost Tours, Heritage Tours and everyday entertainment. She was in her element and everyone loved her for her sunny personality and sense of fun. A special CD of her playing was made to use when she could not be there. In January 2004, May’s husband Fred died, aged 86. For four years, from 2005 to 2008, her grand-daughter, Amanda, stayed with May during the days she was completing her early childhood degree at USQ Hervey Bay Campus. On 19th May 2007, May performed at the Kingaroy town hall for the 75th Anniversary of the Kingaroy Eisteddfod. She was 89. Everyone was amazed with her vitality and performance. On 7 May 2008, the Museum called her saying that she was needed as a substitute for another player who had called in sick. She arrived, ready to play, to discover she'd been tricked into arriving for a 90th birthday party. 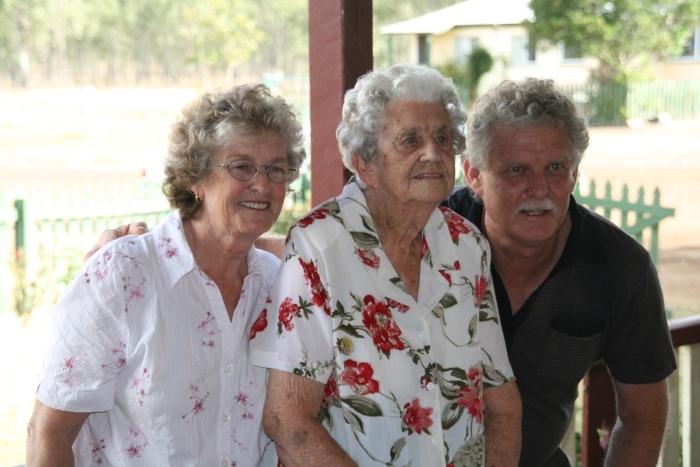 On 11 May 2008, almost the whole family celebrated her 90th at Anne and Nev's property, Windera, 60km north of Kingaroy and 150km south-west of Maryborough (photos above). In January 2009 it became clear that May needed more personal care, so she was moved to Tiaro Care Facility, where she stayed until January 2011. During those couple of years May’s eyesight deteriorated badly; she had two cataracts removed, but they could not treat the macular degeneration. 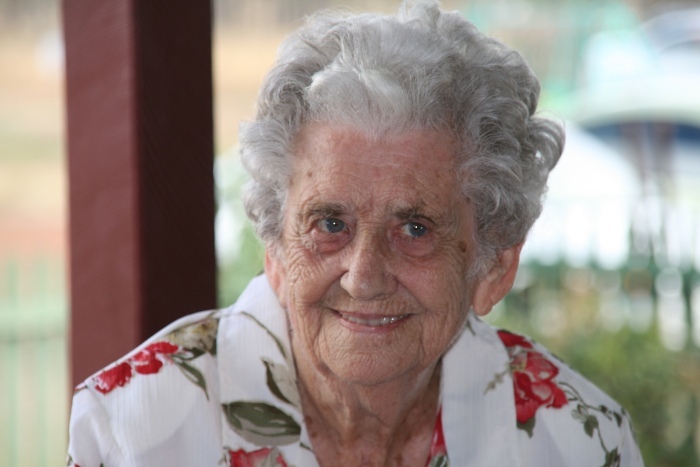 After a wait of 6 months, May was invited to become a resident of Castra in Murgon in mid-2011. The first thing May did after she had been settled in was, you guessed it, suss out where the piano was. The carers said that within about 5 minutes she had a large audience of appreciative residents. May settled in very well and for the first couple of years joined in all the activities with gusto. She often joined in with the other entertainers and had a whale of a time. May was never happier than being the life of the party and entertaining others on her beloved piano. As 2013 drew to a close, she began to decline and become much quieter. 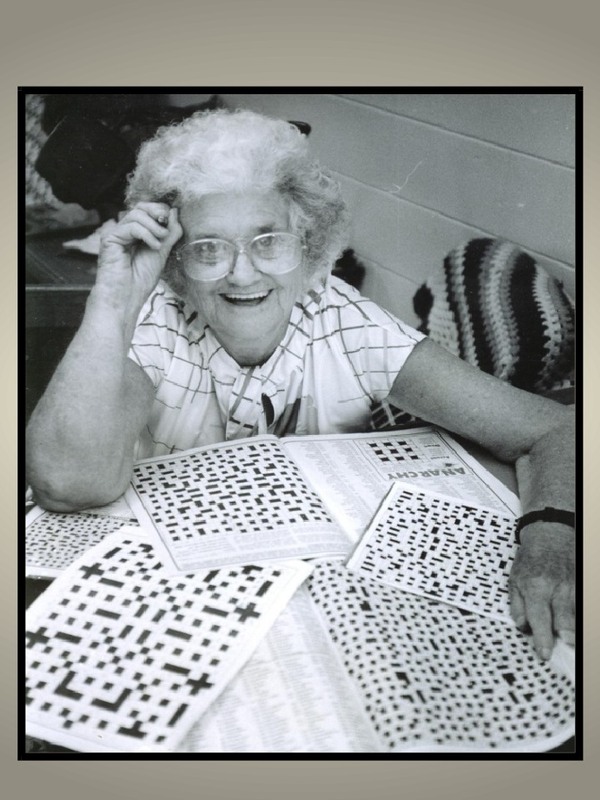 Her poor sight meant that she could no longer see to do her crosswords, or participate fully in other activities, and consequently her memory began to fail, and she frequently became confused and lost. Not lost though was her wonderful memory of all those melodies, just a flick of a switch away, nor her still melodious singing voice. And although May became subdued and didn’t initiate conversations readily in these latter years, she had not lost that childlike glee and mischief, nor her willingness to laugh at herself. From September 2014 it became clear that May’s memory was failing significantly, and her sessions on the piano were few. This was not because she couldn’t remember the music or how to play, but rather that it just needed too much effort. Many residents would ask, “Can May play for us?”. In late 2014 and early January 2015, her health took a turn for the worse, but in typical May fashion, she rallied both times and gained back some of her spark, even using her walker again. Sadly this was not to last, and after a gradual decline, on Monday evening, the 9th of March, one day past the 67th anniversary of her arrival in Australia, and a few weeks shy of her 97th birthday, she quietly slipped away. More information about May's 70 years with Fred is on Fred's page. Their children are listed on their shared entry, and details of their children's families are accessible from there. The information on this page comes almost entirely from May's daughter, Anne Kratzmann.